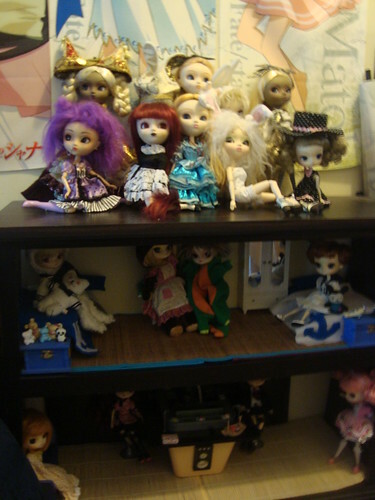 I think I have a fairly large doll collection or at least a fairly substantial one. 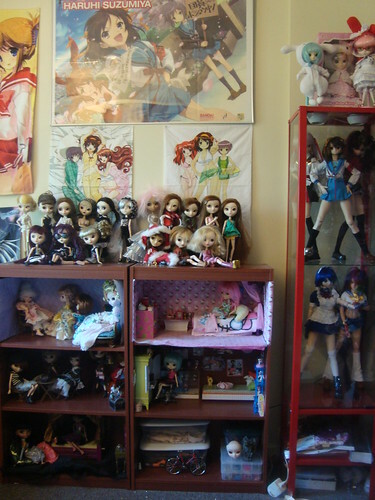 I keep the grand majority of them housed in my computer nook, my computer nook is a small room off of the living room that is roughly the size of a prison cell. 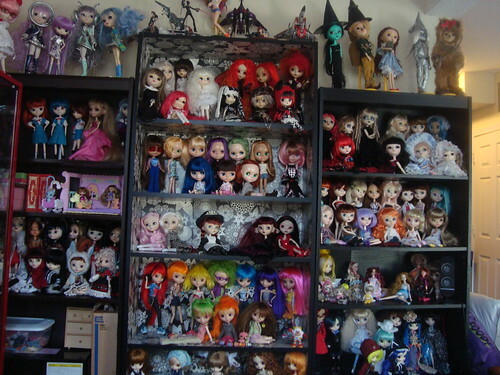 Please note that this is not the entirety of my doll collection as I have roughly half a dozen dolls out on loan/ at the customizers as we speak. 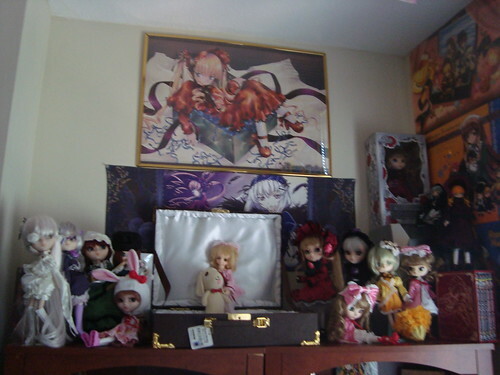 I have almost all of the released pullips/dals (I fell behind on the newest releases because of DDs ^^;) so they make up most of my collection..
My Rozen Maiden display note how the volks Hina Ichigo takes the place of pride in the RM case. Wonderland Alice and dals display. This entry was posted in Doll and tagged adore, afternoon, ala, alexis delarge, alice, alice in wonderland, allison, alma, alte, ambrosia, anarchy, anne, another alice, another clock rabbit, another queen, another soldier rabbit, ante, anthrax, ariana, arietta, arsenic, aspen, assa, asuka, autumn, azazel, azreal, banana split, barasuishou, berry, bianca, billie joe, blanche, blondie, blossom, blu, Blythe, bouquet, bubbles, bumble, bunni luv, buttercup, butterfly, button, calliope, can can cat, carol, charlotte, cheyenne, chii, chill, china china, chloe, ciel, cinciallegra, cinnamoroll, clarity, claudia, clementine, clover, coc, colline, cornice, cosmic twins, cowardly lion, custom, custom dal, custom pullip, daisy, Dal, dalvam, daphne, debut, detective shinku, Dollfie Dream, dorothy, elphaba, emma, enjoy carol, eris, estel, eternia, eureka, eve, faewyn, fairyland, fall purezza, fantastic alice, fate/stay night, fiona, fiori, fourrure, foxxy, frara, friendly freckles, frosty frock, fruit punch, gelato, greggia, grell, hattie, haute la, haute ny, hbpullip 2, heather sky, helena, hello kitty, henreitta, hina ichigo, holly, hyperia, ikki tousen, isolde, j doll, jasmine, jelly bean, jessica, jezabelle, jocelyn, jolie, josie, jouet, joy, julia, jun planning, jupi, jupin, kairi, kanaria, kanu, kiki, kirakishou, kitka, klein beere, kuroshitsuji, lacy, lan ai, lan ake, lei lei, lemon meringue, leprotto, lilith, lily, lipoca, little fee, little red riding hood, lizzie, lrrh, luci, mad hatter, magical pink-chan, malice, manjula, maria, marianne, marie, marilinda, marilyn, marnie, marzipan, matilda, melancholy of suzumiya, melanie, melize, mercedes, mercu, meryl, milch, mimi, mini dal, mini pullip, mint, mitzi, mocha, momo, monomono, moon, my melody, nahh-ato, neo noir, neon genesis evangelion, nero, nina, noir, nomado, nyx, old church street, olivia, oren, oreo, papermoonpixie, papin, paprika, parfait, penelope, penny dreadful, persephone, pickles, piki, pistachio, poison ivy, principessa, prunella, puki, Pullip, raelyn, rei, requiemart custom, rida, rin, rosie red, rovam, roxie, rozen maiden, ryomou, sacralita, sadie, samantha, sanrio, sasha, savon, scarecrow, shinku, shiori, snowflake, sooni, souseiseki, spring purezza, squall, starlight, starshine, stica, suigintou, suiseiseki, summer breeze, summer purezza, sunday very best, sunshine holiday, suzu, swift, tabitha, taffy, takra, tangerine, tezca, tinman, tragedy, trixie, tutti fruity, uncanricky, usagi, venus, veritas, vilette, violet, violetina, vivien, vixen, volks, wicked witch of the west, willow, wind, winter purezza, withered, wizard of oz, wonderland, xiao fan, yoake mae yori ruri-iro na, zoe, zuora. Bookmark the permalink. That’s quite a massive collection you have there! I spy Fanatica! 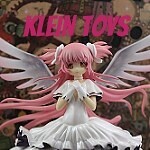 I just love how kind an happy the expression on her face is.